This sturdy toy dog has a domed head, undershot jaw and short nose. It is said the the Brussels Griffon has a human-like pouting expression. The Griffy is happy, affectionate, mellow, and easy to train for obedience. 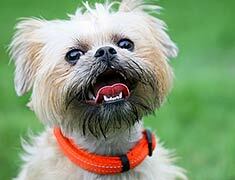 The Brussels Griffon may be red, a mixture of red-brown & black, black & tan, or solid black. There are two types of Brussels Griffon: Rough-Coated (harsh wiry and dense), and Smooth-Coated or Petit Brabancon variety (short, straight, glossy). This breed sheds little to no hair. This charming and clever dog makes an excellent companion. The Brussels Griffon is high-strung and lively and will cause a fuss if it believes it is being threatened. The Brussels Griffon loves to bark, and be spoiled. It can also be a picky eater, difficult to housebreak and moody. The Brussels Griffon suffers from potential eye problems, slipping patellas, difficult to breed (some require Cesarean section), respiratory problems. The Brussels Griffon can be expected to live for about 12-15 years. Brussels Griffons don't require large living quarters and can do well in small spaces. This breed gets the daily exercise they need on their own. 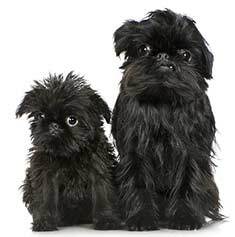 A Brussels Griffon puppy beside an adult Griffy. 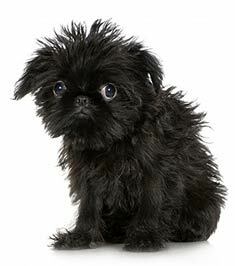 The Brussels Griffon is a toy breed originating in Brussels, Belgium. Also known as a Griffon Bruxellois, the breed name refers to three breeds, differentiated by their coat and color differences. The first, the Griffon Bruxellois is red or reddish-brown and may have some black on his muzzle. The second, the Griffon Belge, is either black and tan or black and red (a combination known as belge). Both of these dogs have a wiry, harsh, dense coat with little or no shedding. The dead hair does not fall out when a new hair takes its place in the hair follicle. To keep the hair from building up, the harsh coat is groomed by pulling out the dead hair by hand in a technique known as stripping. The goal is to prevent the coat from becoming woolly, which is a fault according to breed standards. A distinctive feature of the rough-coated Griffon breeds is the ample beard of fur on his chin. The third breed, the Petit Brabançon, which may be red, black and tan, or black and red, but the coat is short, smooth, and glossy without wiriness. Other than these coat and color differences, the three breeds are identical and will be considered here as one. The ancestry of the Griffon can be traced to a rough-coated terrier type of dog kept in stables to control the rodent population. Known as Griffons d"Ecurie, which translates to "wiry-coated stable dog", these dogs were subsequently bred with the Pug and the King Charles Cavalier Spaniel to create the modern-day Brussels Griffon. Queen Marie Henriette regularly visited the dog shows in Belgium and became a patron of the Griffon, leading to a huge rise in popularity. The breed was nearly wiped out during the two World Wars, but dedicated breeders, particularly in England, rescued the dog from extinction. Although this breed has never ranked as one of the most common dogs, its popularity in the United States surged after being featured in the film As Good as It Gets in 1997. The breed was also a regular on the TV show Spin City and appeared in The Good Companions. Griffons are thick-set, sturdy, and well-balanced. They often feel heavier than you might imagine, given their small size, because of their muscular, well-boned bodies. The tail may be docked to one-third of its original length or may be left naturally long. Kinked tails are common, leading many show dogs to have docked tails to eliminate the kink. The most important characteristic of a Brussels Griffon, from a breed standard perspective, is the head. The head should be rounded or domed and large in proportion to the body. The ears are high-set and well-apart. They may be cropped or carried semi-erect. Dark, black-rimmed eyes are very large and expressive. Their wide-set eyes are said to be similar to an Ewok from Star Wars. The black nose is set at the same level as the eyes and has wide nostrils. The muzzle is very short, measuring less than ¾ of an inch from the forehead to the nose. The underside of the muzzle slopes upward with a prominent undershot broad chin. Although the typical lifespan of the Griffon is 12 - 15 years, there are some health issues with which you should be aware if you are considering having one in your home. Because of the breed's small size, birthing presents challenges for the mother and often must be accomplished by Caesarian section. Puppies are so small as to fit in the palm of an adult's hand. In order to grow, obviously these puppies need to be able to suckle; however, some puppies are born with a cleft palate. This genetic deformity prevents the puppy from getting the proper nutrition from nursing. If a dog with a cleft palate can be hand-raised, surgery may be done to correct the defect. The large eyes and short snout of the Griffon leave him susceptible to eye injuries. Any foreign bodies that happen to be flying by are likely to end up in his eyes, possibly causing scratches to the cornea. Left untreated, these lacerations can lead to blindness. The shape and size of the eyes also can cause glaucoma, where the pressure inside the eyeball rises, leading to eventual blindness. Glaucoma may be the result of lens luxation, where the lens at the back of the eye is displaced. If the lens moves forward, it can block the channels that allow the flow of fluid out of the eyes, letting the pressure build up to the point of glaucoma. Another condition which can result from the dog's short snout is heat stroke. In the heat, the dog is not properly able to cool himself by panting, the way other dogs do. Griffons should not be walked or left outside when it is warm. The Griffon should weigh between 8 and 10 pounds, but has a tendency to gain weight, particularly after reaching adulthood. Although he may be active in his younger years, once a Griffy reaches the age of about 7, he generally decides the couch is the best place for him. Daily walks and a sensible diet will help to keep him in good condition, staving off the onset of arthritis. As far as temperament, the Griffy is happy, affectionate, and mellow. He is relatively easy to train for obedience, but notoriously hard to housebreak. The breed, as with most small breeds, is not recommended for families with young children. The Griffon bonds most closely with his caregiver, so family members should share feeding and walking duties to allow the dog to bond to all members. Many Griffon families note that Griffies have an air of self-importance, providing a laugh when you spend any time observing them. The Griffon is an emotionally sensitive dog, requiring careful socialization at a very young age to prevent both aggression and shyness. They have a heart as big as all outdoors and love to snuggle with the members of the family with whom they have bonded. This is one of those dogs that simply must be underfoot, even when you are actually trying to live your life. The dog simply will not understand that his special people have obligations other than him. If you are considering adding a Griffon to your home, make sure you buy from a reputable breeder, and that you accept the commitment which will be required for the next 12 - 15 years. Your new dog will provide you with companionship, entertainment, and lots of laughs over his lifetime, requiring from you only that you return the love and affection. Find Brussels Griffon Puppies with our Free Breeder search!